The mere definition of what a riddle is, is something that has drawn a large amount of debate between scholars for centuries. 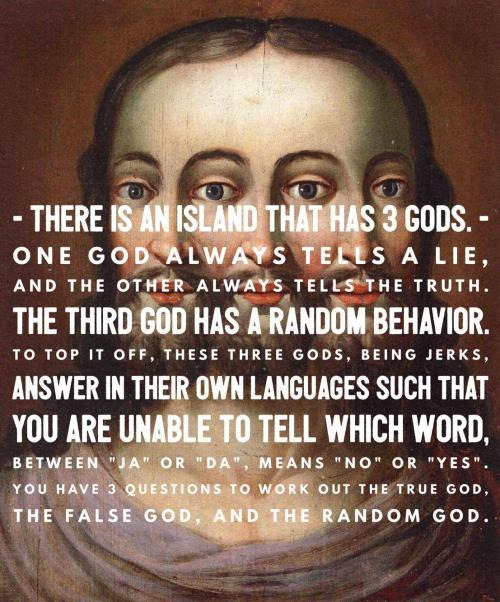 Complex riddles have been used since ancient times, and extensively in ancient/medieval literature. There is only one riddle in the Bible appearing in the book of Judges. 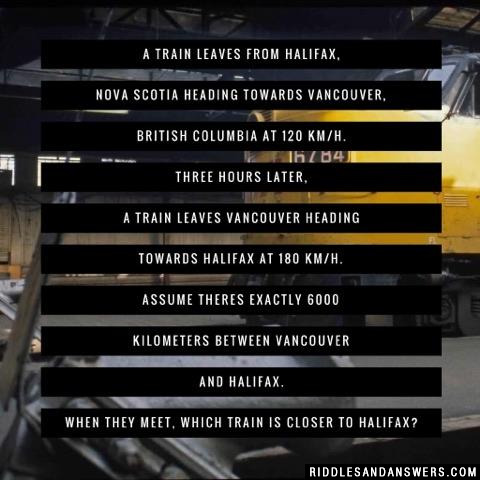 It is known as "Samson's riddle." Charades is a popular contemporary game created with the use of riddle. In author J. R. R. Tolkien's 'The Hobbit' Bilbo Baggins is given a challenging riddle by Gollum, and his life was dependent upon getting the correct answer. 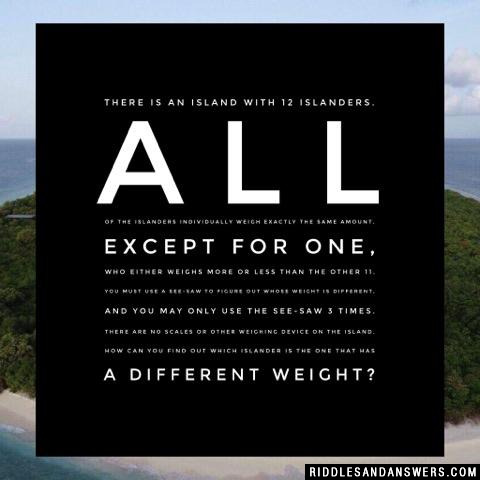 This compilation of very difficult riddles is one of the best riddle collections on the web. 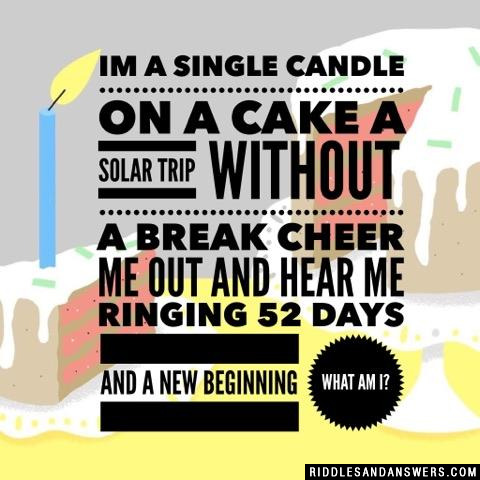 With short challenging riddles like these you may go a bit crazy at times but the mental stretching that you'll receive from completing these incredible riddles will make it worth your while. While some hard riddles are meant for mastering instantly, these are the best of the best and more than likely will not be able to be answered promptly. Whether you are an exceptional thinker who is ready to take on one of the greatest advanced riddles collections known to man or whether you're a teacher that is just looking for some really hard riddles with answers to give out to students, at Riddles and Answers we find the most complex riddles known to man, daily. Remember before starting that these brain teasers are very tough riddles with answers readily available. If you find yourself stuck on one problem for too long, it's ok to move on to the next one. 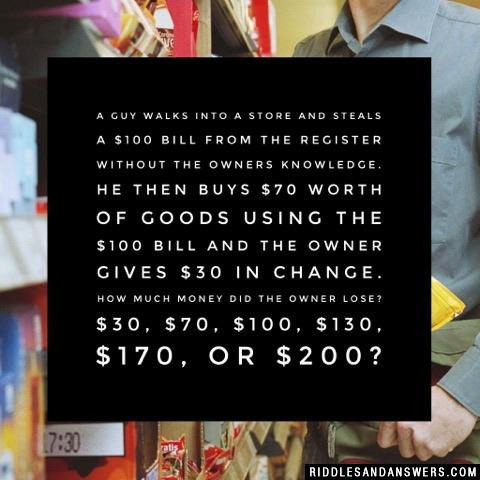 Just be sure to attempt these challenging riddles every day to help keep your brain functioning at a high level. 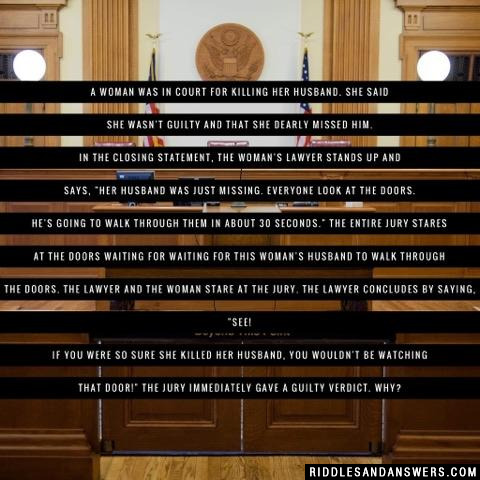 The woman was watching the jury and not the doors because she knew that her husband wouldn't walk through them because she had killed him. If she has really missed him like she said, she would have been watching the doors. Six on one side - six on the other = one side is heavier. Take the heavier six men, divide them into three and three (random). Three on one side - three on the other = one side will one heavier. Divide that three men from the heavier side side, have one on one side - one on the other. Two results can determine which of the last three men weight is a different weight than each other. With the last group of three men, have two men go head-to-head. The see-saw will either weight different: one weights more than the other man meaning the heavier man is the "12th man" or the see-saw will balance between the two men because they are the same weight. That means the third man standing on the sidelines by default weights more than the last two men weighted. Thus making that man on the sidelines the "12th man" that weights more than other 11. Heavier wins 6v6; winner gets divided. Heavier wins 3v3; winner gets divided. Heavier wins 1v1 (12th man) or Equal 1v1 = third man weight more, he's the 12th man. You could find the same results changing the process and picking from the lighter group three times. You’re only trying to find the difference in weight. Not the exact weight (more or less) of that "12th man." Lightest 6v6; Lightest 3v3; Lightest 1v1 or Equal 1v1 = third man weight less. 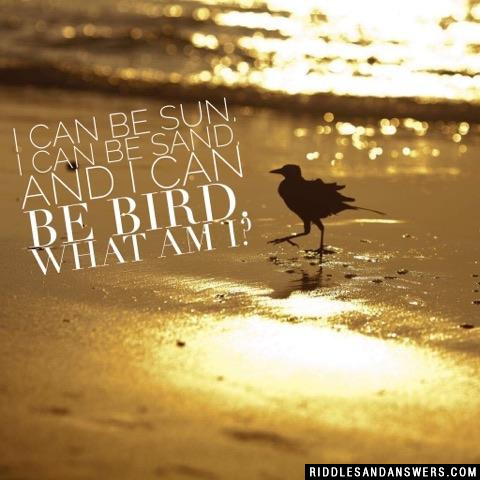 and I can be bird. A clock (sundial, hourglass and cuckoo clock). 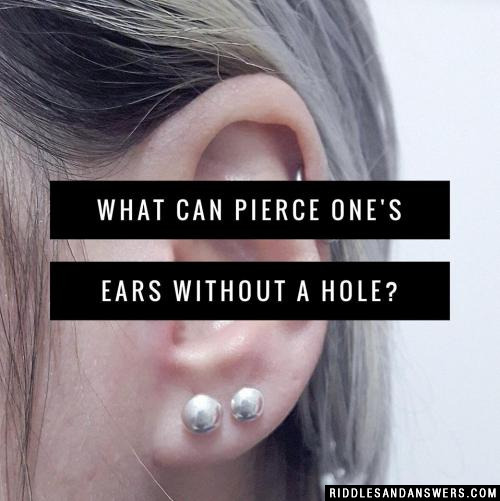 What can pierce one's ears without a hole? 1 of your 7 year cycles! You go through 7 cycles every year. The first cycle starts on your birthday, and each of the 7 cycles lasts 52 days. (7x52=364). You only have to find your personal cycle numbers once, because it's always the same, year after year. "I planted five rows of four Christmas trees each." The man boasted to his boss. 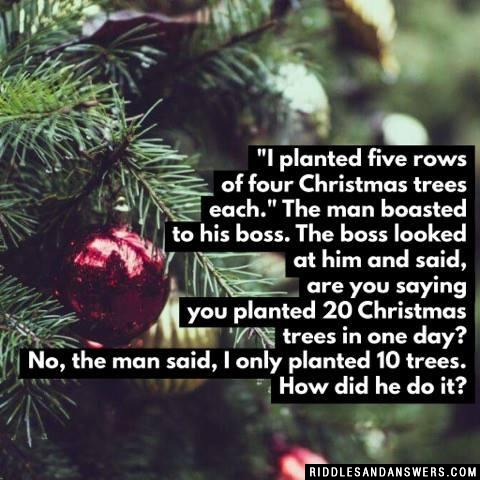 The boss looked at him and said, are you saying you planted 20 Christmas trees in one day? No, the man said, I only planted 10 trees. How did he do it? Just imagine a 5 pointed star, and then plant one tree at each point, and one tree where the sides intersect. Draw a nice long straight line. Draw a second straight line that intersects the first. Draw three more straight lines making sure each line intersects all the lines youve already drawn and avoiding any of the previous points of intersection. That is, no three lines should intersect at the same point. With the first four lines, theres only one topologically distinct configuration, but by varying the position of the fifth line, several different distinct configurations can be created. Can you come up with a cool, funny or clever Hard Riddles of your own? Post it below (without the answer) to see if you can stump our users.